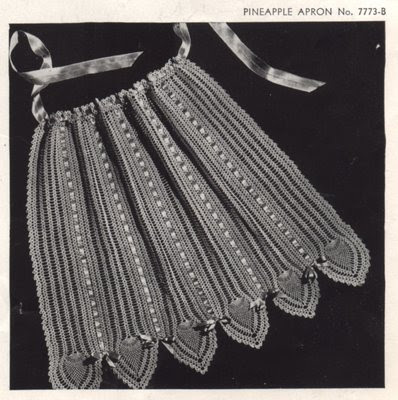 In Bridal Madness: Vintage Bridal & Baby Shower Party Plans, I show off some scans from vintage publications -- mostly mocking them. 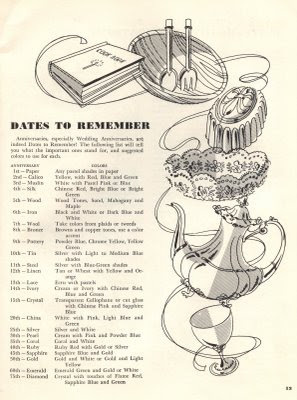 But one page, from The Bride’s Party Book (published by Dennison), has a "Dates To Remember" list. This page not only has the traditional anniversary gifts (paper for the first anniverary, etc.) but "suggested colors to use for each"; I'm guessing the colors are for gift selection as well as colors for party decorations. I always find it a bit sad that after the 15th anniversary, anniversaries are not list for each year, but are then acknowledged in five and even 10 year increments. Is say the 19th year, the 34th or the 62nd any less special and remarkable? If you're like me, you have a lot of those small needlework projects in frames -- some may be done, some may still be in the packaging. 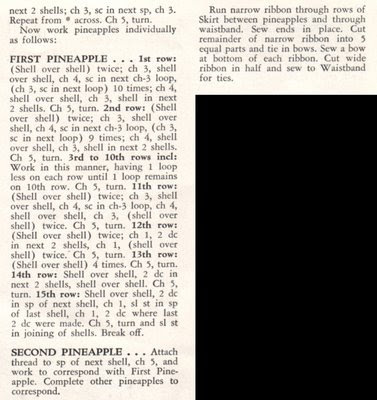 *wink* And if you're teaching your children needlework or they enjoy the hobby, then you have even more of them. Wall space is a limited thing, so I'm always looking for new ways to show-off the works. 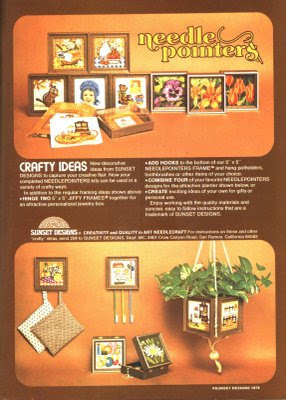 This 1978 ad from Sunset Designs, "Needle Pointers" has "Crafty Ideas" for using your Needlepointers kits. I'm sure they can be used with other kits with wooden frames -- or just be used with wooden frames for photographs etc. Shown here are ideas to add small hooks to hang hot pads, toothbrushes, etc., hinging frames together to make small boxes, and combining four frames together to form a box (in this case, set inside a hanging plant holder -- presumably with the plant already secured in a ceramic or plastic pot with no drainage holes). 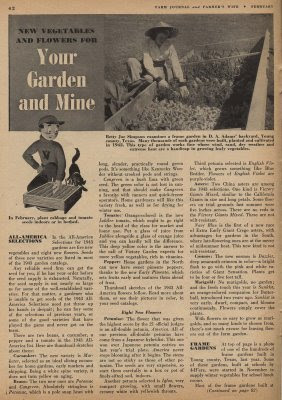 Start your garden and other February gardening tips from Farm Journal and Farmer's Wife Magazine (February, 1943). However, cloth tote bags are much nicer for trips to the store when we walk (and we are known around our neighborhood for walking to the store!). The downside is you are spending money on cloth totes. 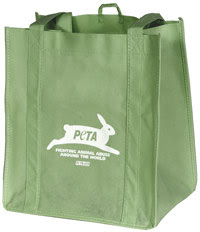 But, as PETA mentions, purchasing a tote from your favorite organization helps support the cause you believe in and it literally helps you carry your message to others. Since totes are popular, the four we have we received free from local companies; so super cheap thrift score! 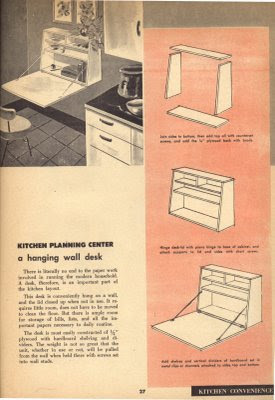 Another practical project from The Family Handyman (March 1956), this wall desk is a space saver, turning any small space in a kitchen (or other room) into a good workspace for making your grocery list -- or for the kids to do their homework while you're nearby supervising. 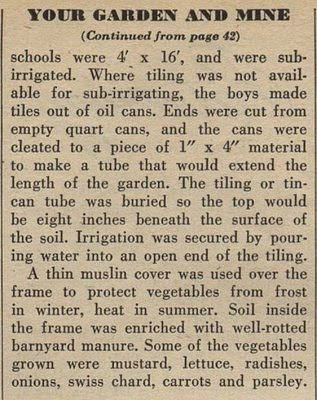 It will easily accommodate such modern things as a laptop too. 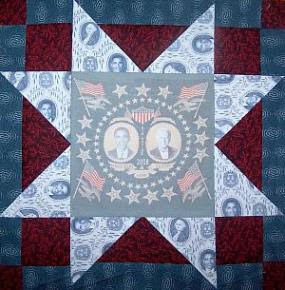 You can't buy this fabric but you can print it yourself and make your own Obama quilt. To celebrate the Inauguration I have put some downloadable PDF's here that you can print onto fabric with your digital inkjet color printer. You need 8 1/2 x 11" fabric sheets that are treated to make them light fast and wash resistant. Check out this web page for Electric Quilt's treated sheets: Electric Quilt. Congratulations to Demmi of Lucky Rosie's -- she won my Bloggy Giveaway of Suburban Diva's book!